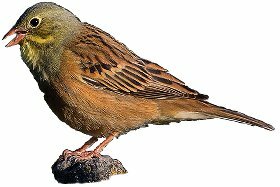 The Ortolan Bunting breeds throughout most of central Europe except for the UK where it is a rare but regular passage visitor. Scrub, farmland and gardens. In the UK whilst on passage is frequently seen in coastal locations. 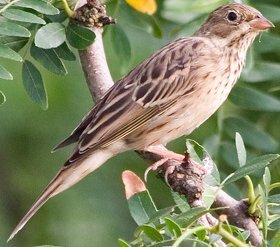 The Ortolan Bunting can be a shy bird, difficult to approach but with a distinctive call and light pinkish bill is usually easy to identify. This image shows the male birds distinctive grey head and orange underside, also note the birds white eye ring and yellow bib. The bill is pinkish which is unique in more common buntings. The female bird lacks most of the male birds colouration, however her pink bill and light moustache with speckled breast make her reasonably distinctive if a good view is obtained. 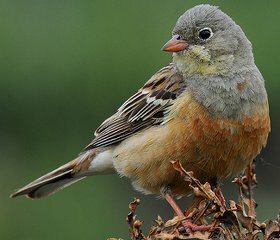 The male Ortolan Bunting has a grey head, pink bill and yellow moustache and bib, his back is brown, streaked with black, and he has a distinctive white eye ring.